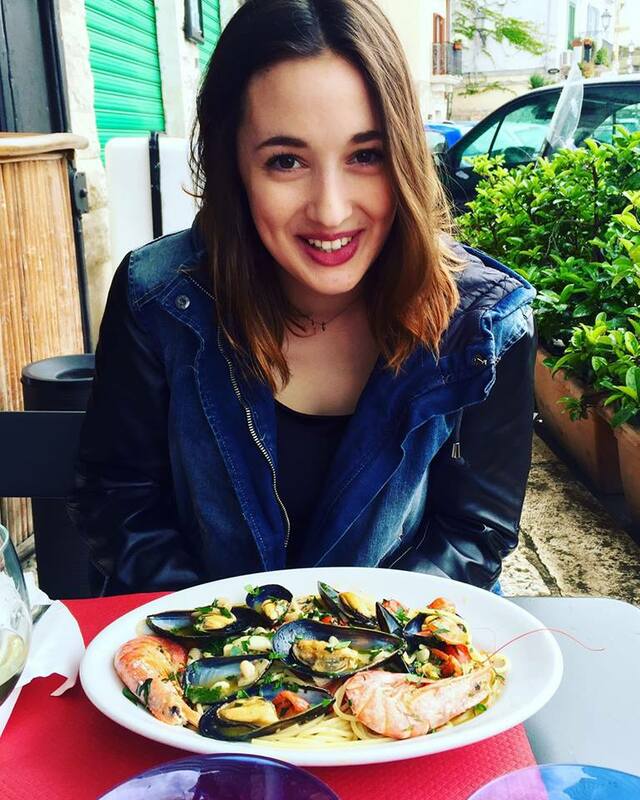 I recently had the chance to chat with alumna, Grace Rambo, about her experiences living and teaching in Italy for more than nine months! 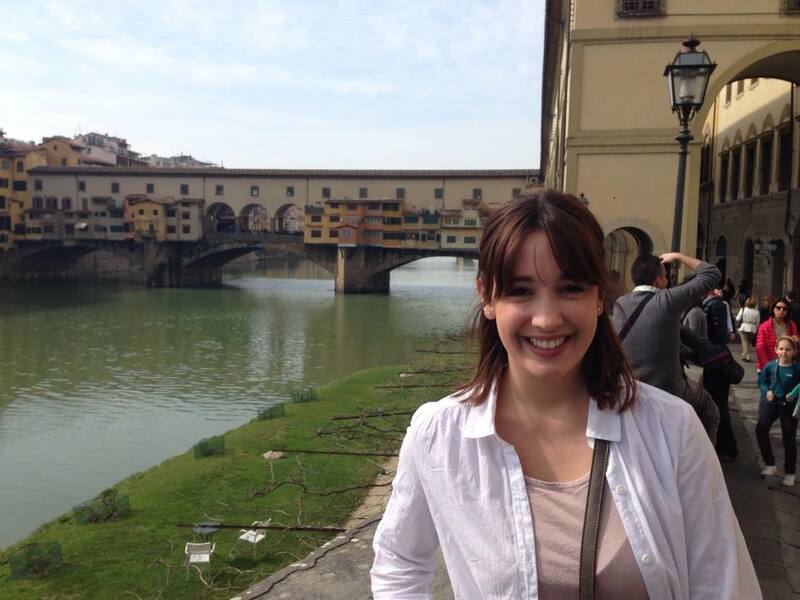 After studying Italian for over nine years, she participated in some great programs through Penn State, as well as ones she discovered on her own. Grace spending time in Bari, Italia. How many years have you been studying the Italian language and are you fluent? I studied Italian language for nine years — since I was in eighth grade! I would say I’m close to fluency, but every once in a while I forget the word for something simple like “glove” and I wonder if fluency is more elusive than I realize. However, after receiving an excellent foundation at Penn State and then living abroad three times, I feel confident in my abilities to speak with any native speaker — and I think that’s a true measure of fluency. Where have you traveled in Italy? I participated in the Todi summer study abroad program, I studied for a semester in Florence through the ISI Palazzo Rucellai program, and I lived in Italy for nine months while I taught in a high school. I’ve been to cities like Siena, Rome, Verona, Milan, Bergamo… and the list goes on. One of the most interesting places I ever visited was the city of Bari, in Puglia. One of my goals this past year was to travel south, since I’d never been. It was certainly a new experience; the city has a much different rhythm than anything I’d ever experienced before. Tell me about your experiences teaching in Italy. I worked in Italy through the SITE Program — a paid internship experience where schools in the north of Italy are paired with young graduates who have made the decision to teach for a short period of time, often without prior experience. I ended up at a tourism and graphic design high school called the Zenale e Butinone, where I taught advertising, law, art history, geography of Australia, tourism, and literature (only a few topics of which I actually knew anything about prior). I taught these topics in English, and that was usually the only part of my day where I spoke (or thought, for that matter!) in English. I always say it was one of the best and most difficult experiences of my entire life. I lived in a small town called Treviglio, outside of Milan. Where before I had been in fairly well-established places, in Treviglio, most people had never met an American before. Very few of my colleagues knew English, except for those who specifically taught it. It was an adventure unlike my other abroad experiences; I was totally immersed in this different way of life. High school in Italy differs so markedly from high school in America in terms of teaching style, grading, and other formal systems, but none of that mattered because connecting with the students there was massively rewarding. How long did you live in Italy for and what did you do while you were there? For this most recent experience in Italy, I lived there a total of nine months. It was my most immersive experience, because besides teaching, I also worked as a tutor, did freelance translation, and on the weekends spent time with my Italian friends. I pushed myself to experience the small town way of life, but also to take advantage of the bustling city life in Milan. I went swing dancing in Milan, saw musical performances, worked with my students to put together a play, and spent many nights cooking with my colleagues. Many people, when they first study abroad, take comfort in staying close to the other people in their program, which is natural. For this last experience, however, I had no choice but to get out there! Do you have any advice for students considering majors/minors in the Italian language? I majored in Italian at Penn State, and minored in art history as well as architectural history. My advice to others would be to consider Italian, because you never know the opportunities it’ll open up for you. I wanted to turn back around after Penn State and become a professor of Italian literature, which is admittedly a competitive arena. But after teaching lessons abroad on web design, social media marketing, and advertising, and realizing how much I enjoyed it, I turned to digital media and publishing, and am now getting my master’s at NYU for publishing: digital and print media. I never would have expected to end up here, but it’s thanks to my fantastic experiences at Penn State and afterward. I would tell students to follow what they love, and trust that studying Italian will open doors to experiences and opportunities they never would have thought possible. Grace at the Ponte Vecchio in Firenze. 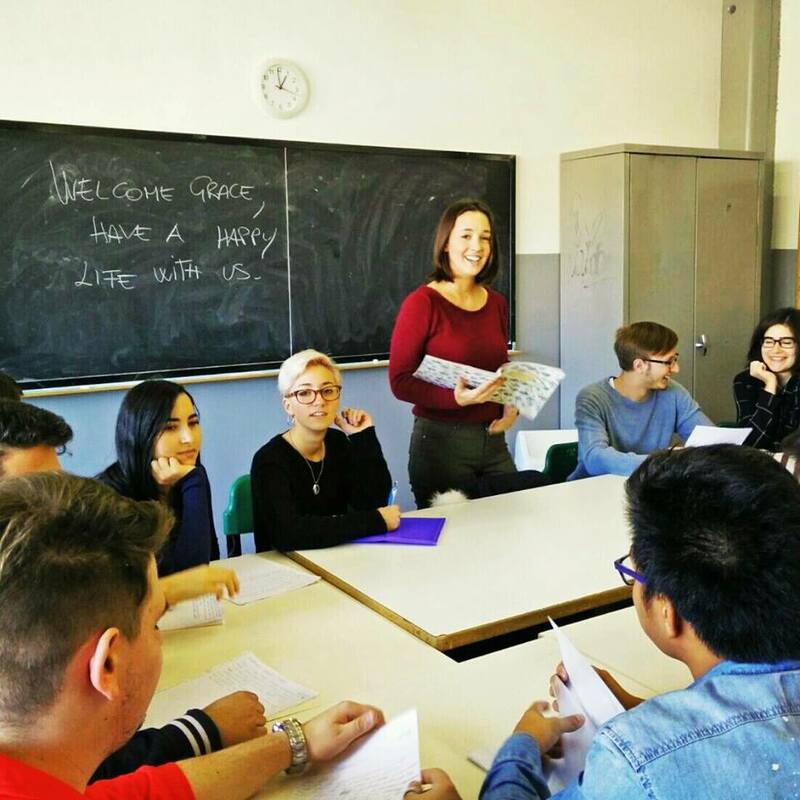 Grace teaching a class in Italia. This entry was posted in Italianist Spotlight on March 30, 2017 by hwf5062. 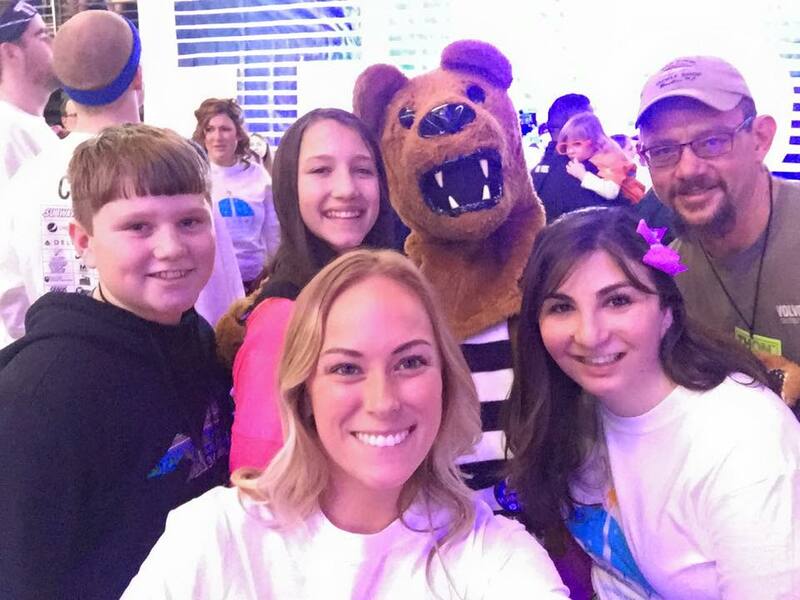 After 46 hours of no standing and no sleeping, I had the chance to sit down with the ISS THON 2017 dancers, Nicole Iannou and Anthony DeFerrari, to discuss their experiences throughout the weekend! Nicole and Anthony during the first hours of THON 2017. In preparation for THON, Nicole went to the gym around 3 days a week. She continued with her normal lifting routine but added cardio in as a warm-up or cool down. She also ate healthier with little to no snacking and drank tons of water every day. The two weeks leading up to THON she got on average of 8 hours of sleep each night and keeping ahead on homework. Anthony’s routine was similar, he adjusted his nutrition and workout routine. A few weeks prior to THON, he stopped taking in caffeine, and cut out sugars from desserts, etc. He ran more, two miles a day after lifting; and, on Fridays and Saturdays, he ran four miles. Nicole said it was truly amazing and inspiring to dance in THON. The kids were so fun to play with and the atmosphere was unbelievable. Looking around the BJC and seeing everyone come together to support the kids meant a lot. There was so much love and support from everyone. 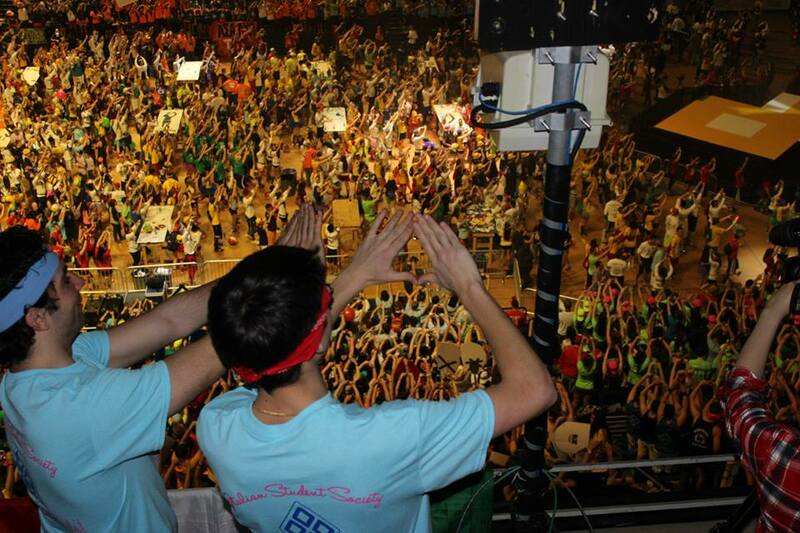 Anyone could dance 46 hours in THON but not everyone could be a fighter like those kids. 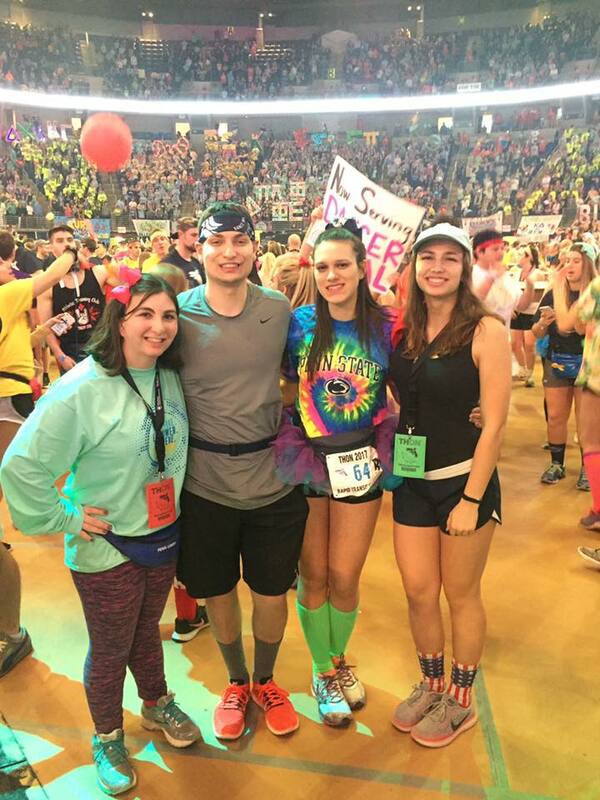 For Anthony, dancing in THON was by far the best experience he’s had as a student at Penn State: I am still at a loss of words to fully describe his sentiment, regarding dancing. Nicole’s favorite part about THON was making new friends. She met another group of dancers and all weekend they hung out playing with kids and playing games. We danced together and had a great time. It felt like we were friends for years. Also making friends with her DRCM made it fun. They were able to dance and make each other laugh and overall have a great time. Anthony’s favorite part during THON this year was hearing the resilience from some of the Four Diamonds families. These stories attested to the imperative mission, and success, of THON. ISS members spending time on the floor at THON 2017. This entry was posted in Italianist Spotlight on February 28, 2017 by hwf5062. Penn State Italian Student Society’s THON chair, Julianna and the rest of the club was so excited to tell me more about their Four Diamonds family. They were paired with their THON child, Aleah, in 2013. The spunky, now fifteen-year-old absolutely loves horses. Every year, the club incorporates her affection for the beautiful animals into their theme for THON. This year their shirts read, “Kicking Cancer and Riding Free”, because Aleah is an avid horseback rider and came up with the slogan herself. 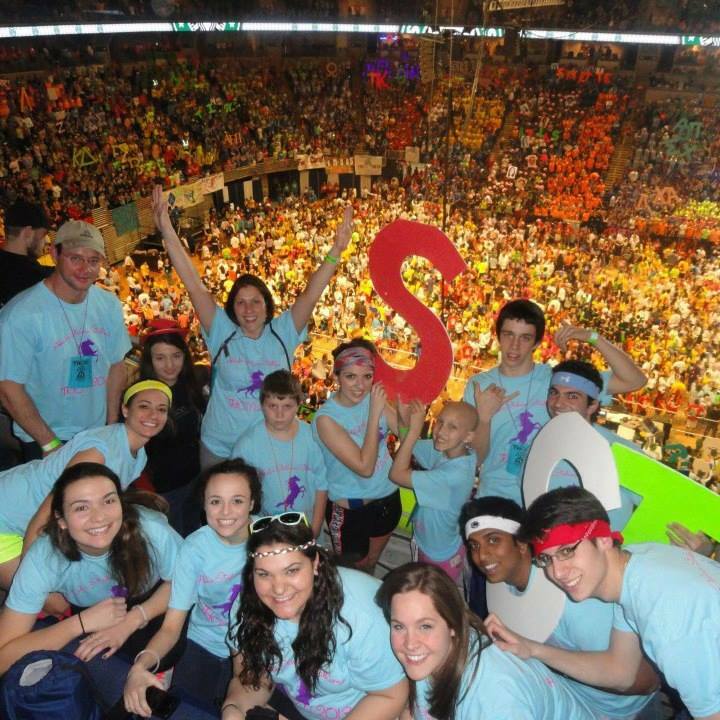 The club with Aleah in the stands at THON 2013, their first THON together. They do all sorts of activities with Aleah, outside of THON weekend too. Aleah keeps in contact with the group, they text and call each other often. The club plans events to do together all the time such as going ice skating at Pegula Ice Rink, attending Penn State basketball games, taking trips to the Berkey Creamery, and enjoying a nice Italian meal. Aleah’s younger brother’s birthday falls during THON weekend this year, and exciting birthday party plans are in the works. “They are such a wonderful family and we are so glad to be paired with them. We always have a good time together and we love being able to give back to them,” says Julianna. The club are looking forward to spending the weekend with Aleah and the rest of her family. THON starts tonight at 6 o’clock. Tune into the live stream here. 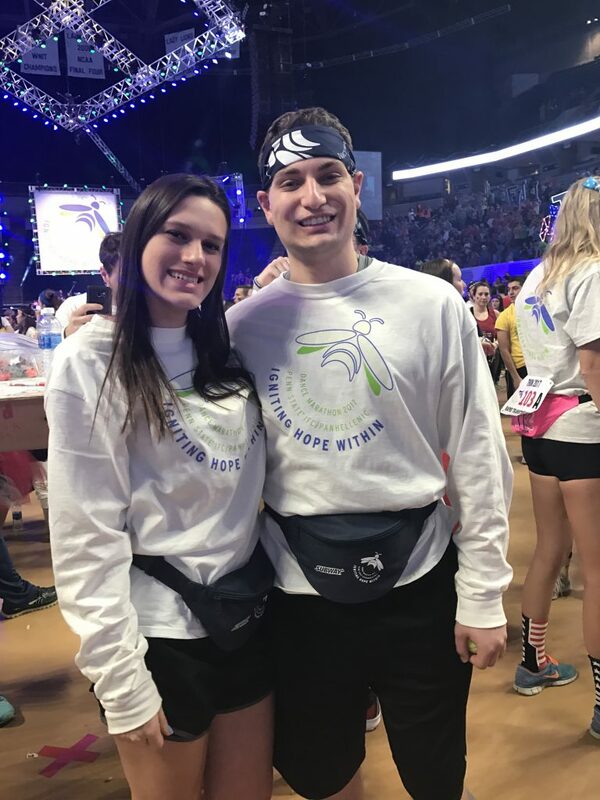 Learn more about Anthony Deferrari and Nicole Ioannou’s experiences at THON 2017, representing the Italian Student Society on the floor for 46 hours in Chapter 3: La Danza Maratona 2017. Some pictures of club members through the years with Aleah, her brother Ivan, mother Michelle, and her father Ben. This entry was posted in Italianist Spotlight on February 17, 2017 by hwf5062. Penn State’s Italian Student Society is preparing for their favorite weekend happening in just TWO days. THON is a student-run philanthropy committed to enhancing the lives of children and families impacted by childhood cancer. Its mission is to provide emotional and financial support, spread awareness and ensure funding for critical research – all in pursuit of a cure. Yearlong fundraising efforts culminate in a 46-hour Dance Marathon, which is happening this weekend! Live stream the weekend here! 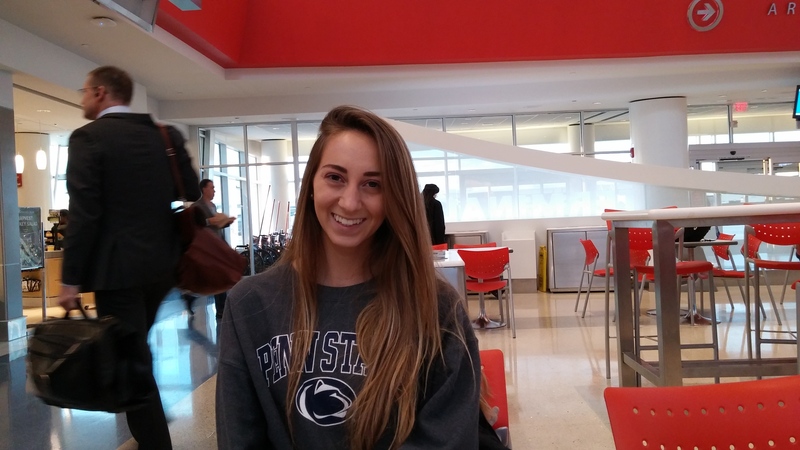 I got the chance to sit down with the Italian Student Society’s THON chair, Julianna Azzizzo, and learn more about their fundraising efforts for THON 2017. 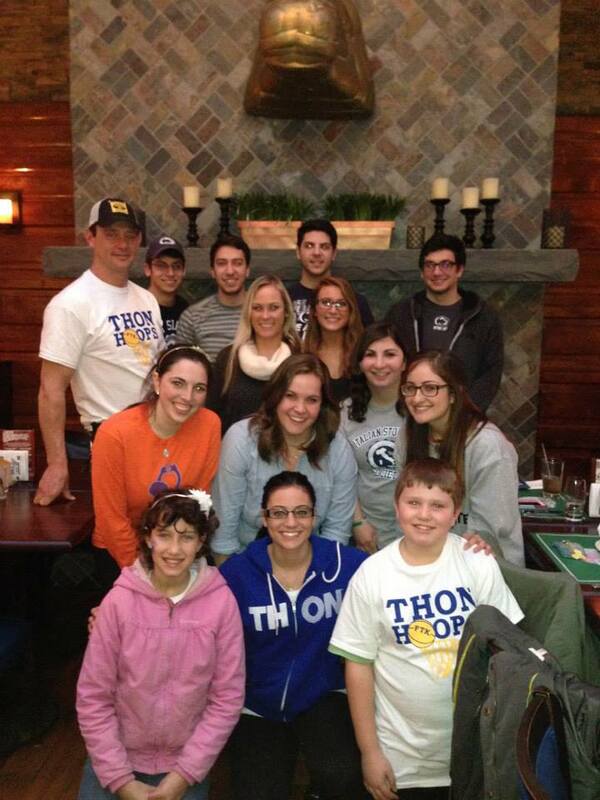 The club was founded in 2007 and has been actively participating in THON since 2011. They are a small organization with about 35 active members who are a mix of Italian majors and minors, Italian descent and students who just want to learn more about the Italian culture. Last year ISS raised $10,000 for the kids, this year they are hoping to beat their total. 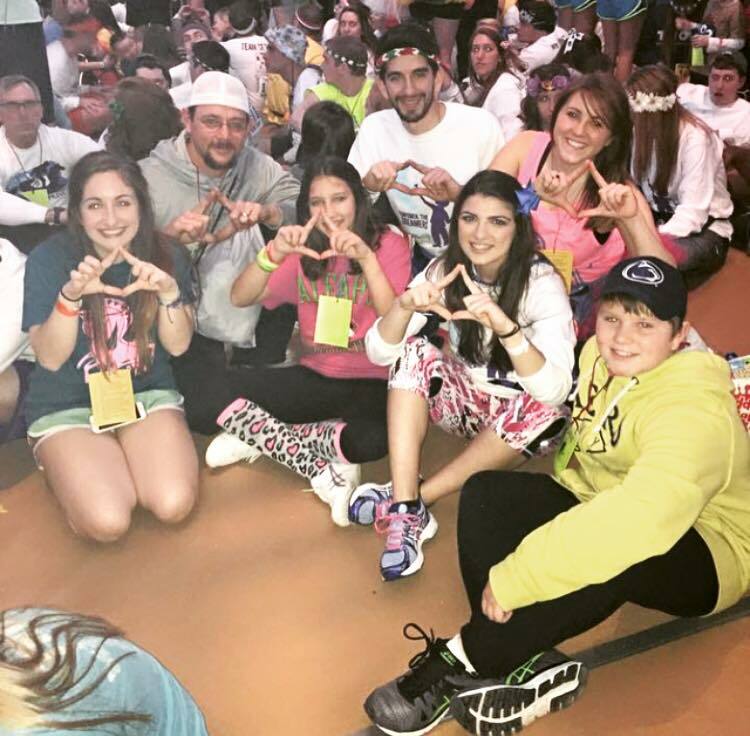 Italian Student Society members at THON 2016, last year. Their fundraising efforts for THON 2017 started in September. 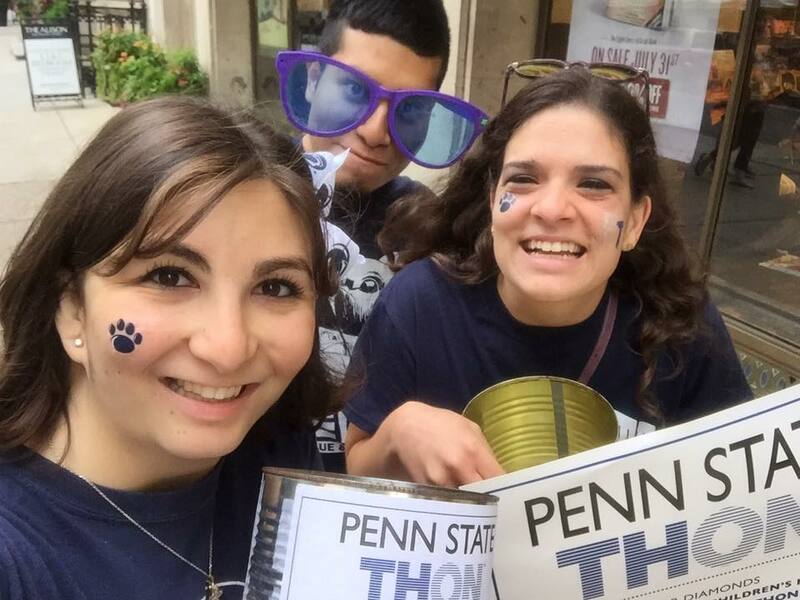 The club participated in “canning weekends” where students stood outside of storefronts, on sidewalks and at other locations holding specially marked cans and signs, encouraging passers-by to donate money to THON. They also host a pasta dinner at the Dorito Church downtown every year. Unlimited pasta with homemade sauce, garlic bread and dessert are served for just a $5 entry fee. This is an event that’s unique to the club. Thonvelopes are also mailed to potential donors. This is the most successful and efficient way to get donations from friends and family while also raising awareness for THON. This year the Italian Student Society also hosted a “Holiday Cash Raffle”. Tickets were $5 each and gave participants the chance to win the grand prize of $500. This was an extremely successful fundraising technique for the club this year, raising over $1,000 for THON. Learn more about the Italian Student Society’s Four Diamonds Family and THON child, Aleah, in Chapter 2: Sua Bambina, Aleah. 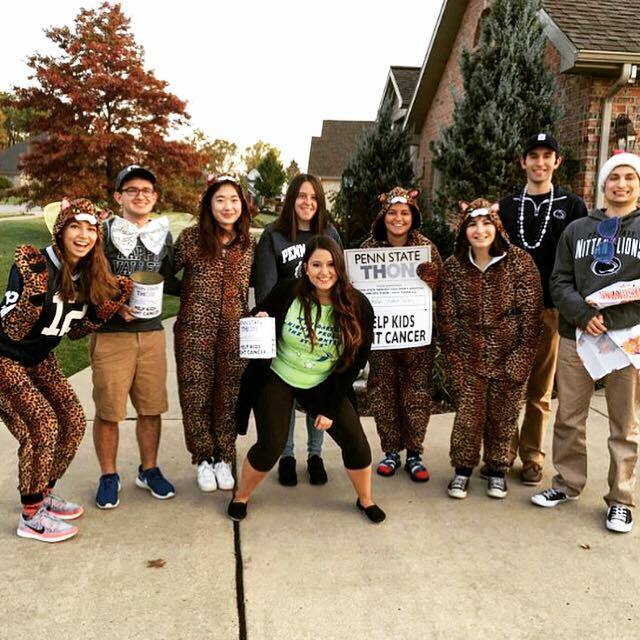 Julianna and other Italian Student Society members participating in canning to raise money for THON. This entry was posted in Italianist Spotlight on February 15, 2017 by hwf5062. 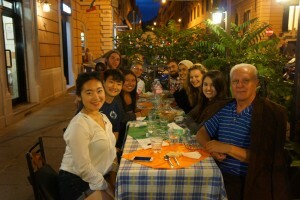 Cici and the Reggio program enjoying their last dinner in Italy. Why did you choose to take Italian? It was totally a random choice that I signed up for an Italian class in my first semester. However, I learned so much after the first semester, and I enjoyed the learning experience and decided to take a minor in Italian so I could learn more about the country on a deeper level. More importantly, I came to Penn to Penn State with no idea what I would do, but now I know that Italian goes hand-in-hand with my major and directs me to do international business work in the future. 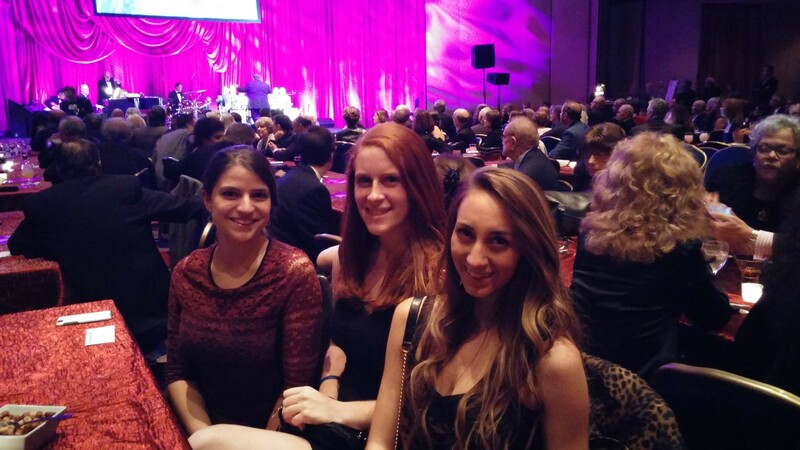 What is it like being an international student at Penn State studying another language? As an international student from China, it is a challenge to convert three languages in my mind and make sure I don’t mix up the English and Italian words. For me, learning a third language can help differentiate myself from my peers. I have a broader global perspective and am more open-minded. Tell me a little bit about your time spent in Reggio, Calabria this summer. In summer 2016, I studied abroad in Reggio, Calabria, which was Penn State six-week program. Through this program, I gained so much experience. Not only did I improve my Italian significantly, but I also had an amazing cultural experience and got the opportunity to meet some terrific people. We spent time traveling throughout Italy and the culture course I took was well blended into the whole journey, so I did not get tired of taking classes at all. I have also strengthened my connections with the Italian department’s faculty. The Italian department at Penn State is a relatively small department so students are taken care of during the program as well as after we return. My advice for students considering majors or minors in the Italian language is to expose yourselves to an Italian environment. Enjoy the language, culture, food, etc. Studying abroad is definitely good option for these students as well. Also, don’t be shy! Students should feel comfortable practicing their language skills and not fear being judged. This entry was posted in Italianist Spotlight on October 4, 2016 by hwf5062. I recently caught up with former Penn State Italian student Brian Tholl in Hartford, CT at the Northeast Modern Language Association’s annual conference. He is currently a graduate student in Italian at Rutgers University. 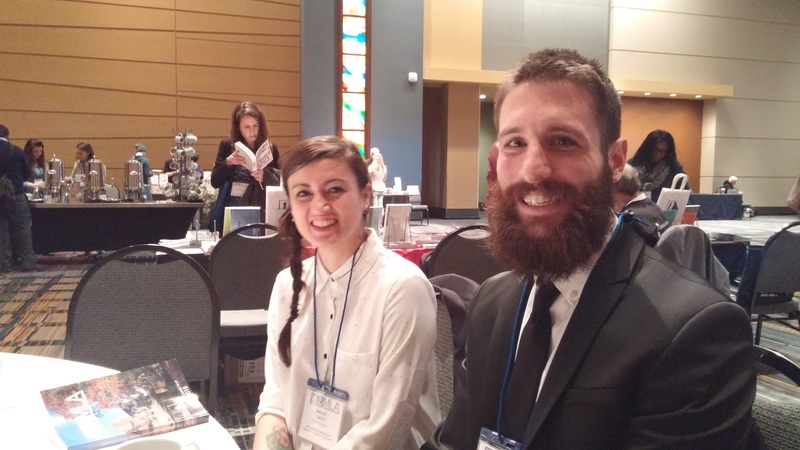 Brian and colleague Eleanora Sartoni at the 2016 NeMLA convention. My research concerns confino – the forced peripheral exile of Italians during Mussolini’s fascist regime. I hope to explore the relationship between imprisonment and southern Italy. What is your favorite thing about Italian culture? My favorite thing about Italian culture is that it encompasses so many different things and is hard to define. We often think of the country’s past, including its tremendous accomplishments in literature, art, and and architecture, to name a few, but equally as important is the local culture of the country, which varies greatly from region to region. There’s always something new to learn about the culture! How has your perspective regarding the language changed as you shifted from being a student to a teacher? I think as a student I was always trying to make the language fit into a neat, little box. However, Italian is a living, breathing language and cannot always be organized using a specific set of rules. My classes encompass far more than memorization, and I like to convey this idea to my students. I think it allows them to be curious and engage with the language in different ways. They start to question why you say certain things in one way in Italian, and begin to wonder what this means for a speaker of the language. What is the best advice that you could give to students studying Italian at Penn State? Learning a language is such a tough, but rewarding experience. It requires work, but you don’t need to treat it like a job. Try to have fun with the language and interact with it as much as possible. Listen to Italian music, watch Italian films, go to Tavola Italiana, or grab a coffee with your professors and chat in Italian. There are approximately 67 million speakers of Italian in the world – you never know who you’ll meet or what kind of opportunities you’ll find because of your ability to speak the language. Forza! This entry was posted in Italianist Spotlight on March 27, 2016 by jir105. 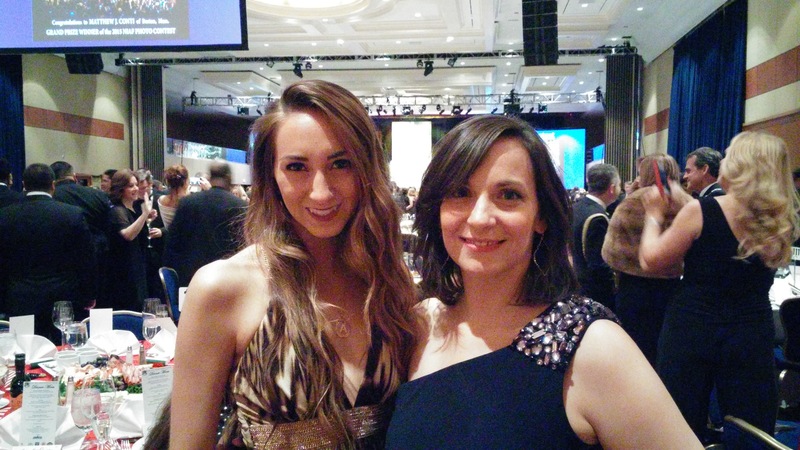 After two tightly scheduled days, I asked Anna to reflect on her experience as a NIAF on Campus fellow at the Washington D.C. annual gala weekend. From my own perspective as a faculty participant in NIAF on Campus, I think that both Anna and I walk away with strong ideas to strengthen the Penn State Italian program and student community. The discussions that we had with other Italian program faculty and students were invaluable and will pave the way for future relationships. It was also great to see how an organization like NIAF, that supports students with scholarship and travel opportunities, might better serve a younger generation. If you are interested in learning about this program and would consider participating in the future email me, Johanna Rossi Wagner, at jir105@psu.edu. This entry was posted in Italianist Spotlight on October 19, 2015 by jir105. The NIAF on Campus fellows spent Saturday morning in a discussion about Columbus Day at the Italian American Leadership Council Forum. The discussion was heated, but there was a clear interest in what the younger generation thought about the holiday. Anna and the fellows were interviewed by Italics, Italian programming by CUNY Television, and i-Italy TV which will be aired at a later date. This entry was posted in Italianist Spotlight on October 18, 2015 by jir105. We discussed three aspects in particular: Internships, mentoring and networking and hopefully we can see how we can work together with NIAF to create more opportunities like this, but also keep Italian heritage central to this. In the following posts Anna will discuss some of the projects at Penn State that she anticipates working on as a fellow this year and ways in which the community of NIAF fellows can collaborate. This entry was posted in Italianist Spotlight on October 17, 2015 by jir105. 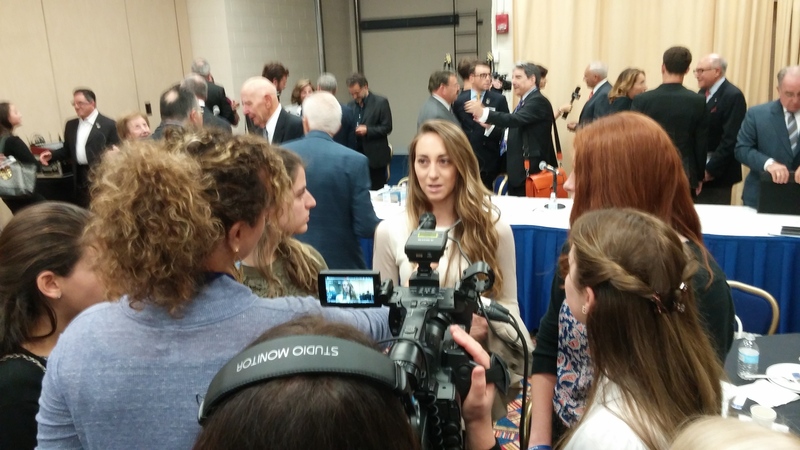 Penn State sophomore Anna Centrella was recently named a NIAF on Campus Fellow. The National Italian American Foundation, an organization that has been supporting Italian American culture since 1975, launched the program to engage young leaders in the Italian American community. Anna, a double Finance and Italian major, is among the first fifteen fellows and has been invited to participate in the foundation’s 40th Anniversary Gala in Washington D.C. She’ll be sending updates and photos about the weekend events and her role as a fellow. What do you expect going into the events this weekend? I not sure what to expect, but I am really looking forward to meeting other Italian Americans, mostly other students, but also faculty members… and trying to figure out how we can make the Italian American identity a lot stronger on campus and get more people involved. This entry was posted in Italianist Spotlight on October 16, 2015 by jir105.